DHARAMSHALA, Jan 4: An outspoken critic of human rights violation and a long time Tibet supporter, Nancy Pelosi, has been elected the Speaker of the House of Representatives for the third time on January 3, 2019. Pelosi, a two-time House Speaker, previously served in the post from 2007 to 2011. She is currently in her 17th term as a Member of the House of Representatives, first being elected in a 1987 special election. Pelosi is also a two-time House Minority Leader, serving from 2003 to 2007 and again from 2011 to 2019. 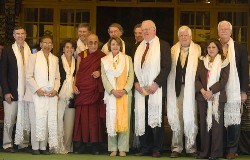 During the 2008 uprisings in Tibet, Pelosi visited the virtual capital of the Tibetan administration in Dharamsala, taking part in an official event attended by the Tibetan leader His Holiness the Dalai Lama. "If freedom-loving people throughout the world do not speak out against Chinese oppression in China and Tibet, we have lost all moral authority to speak on behalf of human rights anywhere in the world," Ms Pelosi told the gathering on March 21, 2008. “What a wonderful gift it would be if China would treat the Tibetan people with the dignity and respect they deserve, and let the Dalai Lama go home to Tibet, whether to visit or to stay,” the piece stated. Pelosi also led a US Congressional delegation to Tibet in 2015. Democratic Representatives, Jim McGovern of Massachusetts, Betty McCollum and Tim Walz of Minnesota, Joyce Beatty of Ohio, and Alan Lowenthal and Ted Lieu of California accompanied Pelosi on the visit. Pelosi, who has been outspoken on the issue of human rights and a great supporter of the Tibetan leader Dalai Lama and the Tibet cause, first led a delegation to China in 2009.